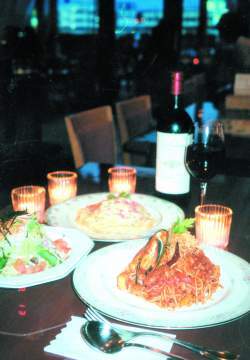 For people looking for a romantic place to dine, a visit to Kitaru, a pasta restaurant in Mihama, Chatan Town might be in order. 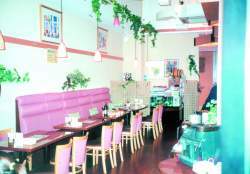 The restaurant has a very romantic interior for couples to share, and at lunchtime the place is also very popular among office ladies in that area. At lunchtime, lots of couples and groups of female customers visit to eat good Italian pasta costing only ¥750 including soup, salad and soft drink. Pescatore, a seafood pasta is the best seller. It features plenty of shellfish, shrimp and clams in tomato based seasoning. For calorie watchers, the menu has Healthy Spaghetti with its original sauce that is based on soy sauce and radish mix. The dish is a curious but pleasant mixture of cold sauce and warm pastas. Other ingredients include radish, carrot, “enokidake” and “shimeji” mushrooms and green asparagus. As far as ingredients go, it can’t get any healthier than this. The restaurant also features seasonal dishes. The Summer Menu includes Summer Vegetable Curry that is a big hit especially among tourists. This curry is totally different from vegetable curries served in many other restaurants. The chef at Kitaru mixes his curry with cucumber, bitter melon (called Goya in Okinawa) and eggplant, all known as summer vegetables. Especially, the bitter melon is a special ingredient that attracts mainland tourists. On the first try, its bitterness may not taste so good, but from the second time on its taste actually becomes attractive and some claim even seductive. Most mainland tourists traveling to Okinawa are curious about the vegetable, which recently has gotten a big publicity boost having been prominently featured in the current NHK TV morning drama, “Churasan”, which centers on the life of an Okinawan girl. Consequently, the vegetable’s popularity has soared. Most of visitors, however, do not know how to cook the vegetable. And also for a limited time during the summer, the restaurant serves tropical drinks and cocktails containing mango, pineapple and shiqwasa (okinawan lemon). Customers are, needless to say, satisfying their curiosity about Okinawan fruits with a glass or two of the vivid colored drinks. The restaurant has a terrace also that probably could be the most romantic part of the shop. It invites customers to eat in the gentle Okinawan summer breeze and under the moody light of the moon and the stars. Kitaru is located on the second floor of Carnival Park, Mihama. The building is easy to recognize for the Ferris wheel on the top. Their phone number is 098-982-7758. Free parking space is available. Only yen is accepted.